For more than 54 years, Shed City Pty Ltd has been an Australian steel design, manufacturing and fabrication Company, supplying Factory Direct to the Public. Shed City is a designer, manufacturer and supplier of custom made / prefabricated garden sheds, carport, garages, farm sheds, machinery shed and light industrial buildings made from steel and related products, selling direct to the public since 1965. Shed City supply ready to assemble, DIY kits for these products. (as part of our sales service we can also assist with your permits and are aware of a range of independent installers (subcontractors) who may be able to assist you directly). Shed City also supplies a range of standard building materials as part of the kits or they can be supplied in their own right. We also resell for other garden shed companies both timber & steel sheds. Shed City has many component suppliers as well as is part of the Hardware & Building Traders group (HBT) (who supply into the independent hardwares etc) so have access to a large range of building materials and hardware. Our small family business commenced in 1965 originally home based in Ferntree Gully, Victoria. The original Verandah’s and Patios business grew and soon a Factory was built in Ferntree Gully Road. Shed City’s Rosebud Flat Pack Shed design quickly became popular with customers travelling from across Victoria and beyond to view and buy this versatile product. This was the forerunner to the bolt together design used not only in garden sheds but the Carports, Farmsheds and Garages supplied by Shed City today. This method of pre-manufacturing means that customers receive high-quality sheds every time. By 1986 a larger factory was needed, hence the move of the base of operations by Shed City to Kilmore, Victoria, the current site of manufacturing as well as our Large Display. Our aim is to provide clients with convenient, cost effective, high quality pre-engineered steel buildings. Whether you require a building from our Standard range or a building that is completely customized to suit your application. At Shed City our experienced sales staff can assist you by providing a competitive quote to suit YOUR requirements. Our success is based on the result of striking a balance for our clients between aesthetic appearances and being practical. We don’t believe that an economical steel building has to look cheap or that an attractive building has to exceed your budget and by applying years of skill and experience, we strive to meet both goals equally well. To assist Customers in the future, Shed City keeps a database of materials, sizes and colours to assist with matching your other projects on site. As well as the large range of steel products and components that we pre-fabricate in Kilmore we have available hardware, fibreglass and polycarb sheeting, insulation, rainwater goods, tanks, doors and a huge variety of flashings, custom made flashings and many more products. The product knowledge gained from our years of service in the building, engineering, roofing and hardware industries as an Australian owned independent manufacturing business along with the vast array of products available means we can readily assist you with your building requirements. Shed City business history means we have the buying power independently, and as part of the Hardware & Building Traders Group HBT, and we have the ability to pass the savings on to you, providing you with a superior product for your dollar. Shed City is a designer, manufacturer and supplier of custom made & prefabricated garden sheds, carport, garages, farm sheds, machinery shed and light industrial buildings. 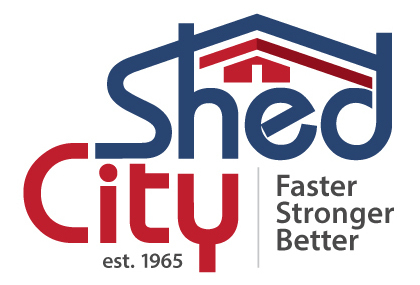 Shed City provides clients with convenient, cost effective, high quality pre-engineered steel buildings. Shed City supplies premium sheds from Kilmore throughout Victoria & beyond. For custom orders to suit your requirement & budget call 1300799636.